Centromere protein B (CENP-B) is one of the major proteins involved in centromere formation, binding to centromeric repetitive DNA by recognizing a 17-bp motif called the CENP-B box. Hominids (humans and great apes) carry large numbers of CENP-B boxes in alpha satellite DNA (the major centromeric repetitive DNA of simian primates). Only negative results have been reported regarding the presence of CENP-B box in other primate taxa. Consequently, it is widely believed that CENP-B box is confined, within primates, to the hominids. We report here that the common marmoset, a New World monkey, contains an abundance of CENP-B boxes in its alpha satellite DNA. 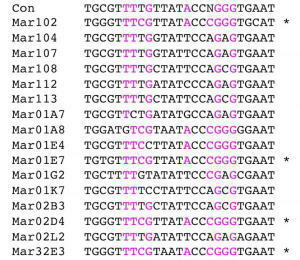 First, in a long contig sequence we constructed and analysed, we identified the motif in 17 of the 38 alpha satellite repeat units. We then sequenced terminal regions of additional clones and found the motif in many of them. Immunostaining of marmoset cells demonstrated that CENP-B binds to DNA in the centromeric regions of chromosomes. Therefore, functional CENP-B boxes are not confined to hominids. Our results indicate that the efficiency of the identification of CENP-B box may depend largely on the sequencing methods used, and that CENP-B box in centromeric repetitive DNA may be more common than researchers previously thought.